What makes a project successful? The people who work on it. Donna Teagle of Floor Coverings International is the one to make your flooring project a success. She has been in the industry for more than 20 years and as a wife, mother, and home owner, Donna knows the importance of selecting the proper coverings that will merge your lifestyle with a floor surface that will look great and be long lasting. We all have busy lives and Donna simplifies the decision process by bringing the Floor Coverings International showroom directly to your home at a time that is convenient for you. This allows you to view a multitude of flooring choices, styles and colors under your lighting with your furnishings, AND gives you the opportunity to experience Donna's wealth of knowledge and guidance in the decision process. Donna's service does not stop with the sale. 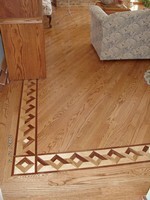 She has excellent installers who average 30 years of experience in floor surface installations. She follows up, is quick to call you back, friendly and professional. As a lifelong resident of Chicago's Western Suburbs, Donna is proud to be a part of a company that believes in giving back to the local community. Some of the local community and non-profit organizations that Floor Coverings International has worked with over the years include Feed My Starving Children, Outreach Community Ministries, Ray Graham Association, Wheaton Chamber of Commerce.